[S182] Social Security Death Index (on-line), Ancestry.com, SSDI, Ancestry.com, SSAN 340-05-5340. Byron Hutcheson died in 1902. He was born in 1902. He was the son of George Pierce Hutcheson and Lillian Parks. George Hutcheson died in 1905. He was born in 1905. He was the son of George Pierce Hutcheson and Lillian Parks. Gerald Park Hutcheson was born in 1910 at KS.1 He was the son of George Pierce Hutcheson and Lillian Parks. Sarah Haines was born in 1855 at Byhalia, OH. She was the daughter of Jonathan Haines and Mary Jane Sprague.1 Sarah Haines married Jacob Marion Flickinger, son of Stephen Flickinger and Margaret Ann Figley, in 1872. Sarah Haines died in 1888 at Byhalia, OH. James and Chloe were enumeated in the 1860 Hickory, Mercer Co., PA, federal census. He was a coal merchant, age 48, she was 44. Children in the household were Jonas J. 20, Wallace 17, Walter 17, Franklin 7, and Jas. Buchannan, 3. James and Chloe were enumerated in the 1870 Hickory, Mercer Co., PA, federal census. He was a farmer, age 59, she was 54. The only child in the household was Walter 27. Children of Chloe Holbrook and Gen. James Pierce Jr.
Nathan Marvin was born on 21 November 1714 at Lyme, New London Co., CT.1 He was the son of Samuel Marvin and Susannah Graham.1 Nathan Marvin married Lydia Lewis. Lydia Lewis married Nathan Marvin, son of Samuel Marvin and Susannah Graham. Samuel Marvin was born in 1671 at Lyme, New London Co., CT.1 He was the son of Lt. Reinold Marvin Jr. and Sarah Clarke.1 Samuel Marvin married Susannah Graham on 5 May 1699. Samuel Marvin died on 15 March 1742/43 at Lyme, New London Co., CT.
Susannah Graham married Samuel Marvin, son of Lt. Reinold Marvin Jr. and Sarah Clarke, on 5 May 1699. Lt. Reinold Marvin Jr. was born in 1634. He was the son of Reinold Marvin and Marie (? )1 Lt. Reinold Marvin Jr. married Sarah Clarke. Lt. Reinold Marvin Jr. died in 1676 at Lyme, New London Co., CT.
Sarah Clarke was born on 18 February 1643/44 at Milford, New Haven Co., CT. She married Lt. Reinold Marvin Jr., son of Reinold Marvin and Marie (?). Child of Sarah Clarke and Lt. Reinold Marvin Jr.
Marie (?) married Reinold Marvin, son of Edward Marvin and Margaret (?). Margaret (?) married Edward Marvin. Matthew Marvin was born on 26 March 1600 at Great Bently, Essex, England. He was the son of Edward Marvin and Margaret (?) Matthew Marvin married Elizabeth (?) in January 1622 at St. Mary's, Great Bently, Essex, England. Matthew Marvin died on 20 December 1678 at Norwalk, Fairfield Co., CT, at age 78. Elizabeth (?) married Matthew Marvin, son of Edward Marvin and Margaret (? ), in January 1622 at St. Mary's, Great Bently, Essex, England. Benton Garrett Moore was born on 12 September 1943 at Dallas Co., TX.1 He was the son of Harry Claude Moore Jr. and Maurine Garrett. Benton Garrett Moore married Cheryl A. Chandler on 12 November 1987. Benton Garrett Moore died on 4 September 2005 at south of Gillette, WY, at age 61; while on a hunting trip.1 He was buried on 12 September 2005 at Big Hill Cemetery, Groesbeck, Limestone Co., TX. As a young man "Butch" was an Eagle Scout and attended the National Boy Scout Jamboree in Valley Forge. He was later an All-District Co-Capt of the football team, track team and participated in several other sports, was Class Favorite, a Class Officer and Ag. President for the Goats and graduated from Groesbeck High School in 1962. He later attended Sam Houston State University where he was a member of the Agricultural Marketing Club, was President of the Livestock Judging Team, which received numerous awards, and was an avid supporter of the Agricultural FFA. Benton graduated with a Bachelor of Science in Biology in 1967 and the following year received his Master of Arts in Agriculture from the same University and later became a member of the Sam Houston Alumni Board for College Rodeo. He was inducted into the United States Army in 1969 and served as a medical technologist stationed in Sandia Army Base, New Mexico during the Vietnam conflict where he earned the national Defense Service Medal for Sharpshooter. Benton served his community as a member of the Groesbeck School Board and was a Master Mason in Groesbeck Lodge #354. In 1972 he began a saddle and tack repair business associated with a feed store he owned at the time. He made the first custom saddle in 1975 as a hobby and spin-off of the repair business. Benton Moore Saddlery, a custom hand made saddle company, was born. Located in Groesbeck, Texas on the leading edge of the Historic Great Plains, the scenery serves as a constant source of inspiration for the premier quality, one-of-a-kind saddles being hand crafted in the saddle shop. Popular as Rodeo timed events equipment, the saddles made at Benton Moore Saddlery are tough and durable. You can see them in action in the Rodeo arena as Team Roping, Calf Roping, Tripping, Barrel and Pole Bending saddles. Just ask WORLD CHAMPION TEAM ROPER Walt Woodard about the saddles he rides. Woodard, the 1983 World Champion endorses the Benton Moore saddles. Benton Moore believes in custom tailoring each saddle. “The thing that sets us apart” says Benton, “is our ability to individually custom fit each horse and rider.” Over 25 Years of experience is going into each hand made saddle being crafted at the saddle shop today. Attention to detail is the primary focus in the manufacturing process. “Our specialty is an ability to alleviate soreness and saddle fitting problems and thus maximize efficiency and enjoyment for both horse and rider.” The end result is a one-of-a-kind masterpiece that will serve well and gain in value as a cherished piece of art. Benton's first love was working his ranch in Thelma, Texas. He had only recently retired from the Professional Rodeo Cowboys Association as a team roper when he died. He was an all around cattleman. He was also the Texas State Senior Outdoor Archery Champion for 2004. He especially enjoyed spending time with his sweetheart, Patricia. 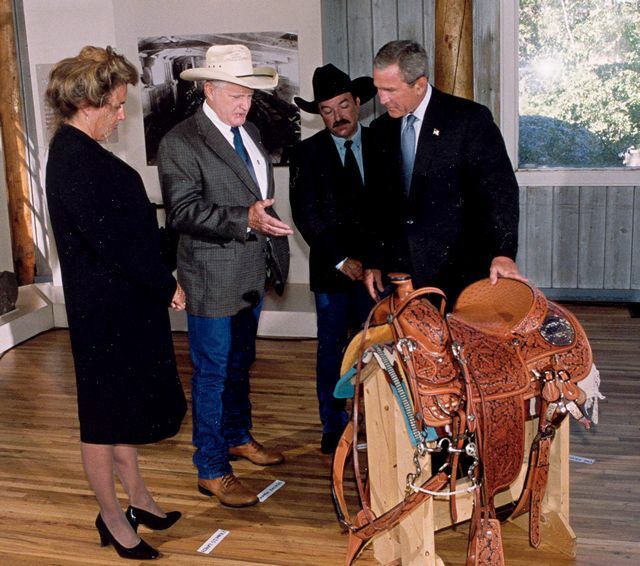 He was selected to create the "Saddle of Independence" to be given to President Bush by the Black Hills Stock Show Foundation not long after 9/11. He died of a blood clot while hunting in Wyoming, a favorite pasttime. "Butch," as he was sometimes called, had lived in Groesbeck for the majority of his life, was a devoted father, a respected businessman, a good and loyal friend, a genuine cowboy, a great America and a life long Methodist. He is survived by his son, Clayton Moore, of Groesbeck; step-sons, Christopher Clemons of Dallas and Robert Clemons along with wife Amy and daughter Chloe, of Port Harcourt, Nigeria. He is also survived by his sister, Betty Moody and husband Doyle, of Waco, his brother, Terry A. Moore and wife, Cheryl, of Plano. Also, nephews, Frank Jackson of West Palm Beach, Florida, Gary Jackson of Prosper, David Jackson of Dhahran, Saudi Arabia, cousin, Robert Cook of Birmingham, Alabama, and several great-nieces and nephews as well as his devoted friend and loving companion, Patricia Ortiz. [S182] Social Security Death Index (on-line), Ancestry.com, SSDI, Ancestry.com, SSAN 466-70-0521. Boyd Roberts Garrett was born on 5 September 1881 at Stranger, Falls Co., TX.1,2 He married Euleta Maffett. Boyd Roberts Garrett died on 8 July 1963 at Limestone Co., TX, at age 81. Boyd and Euleta wee enumerated n the 1910 Justice Precinct 8, Limestone Co., TX, federal census. He was a farmer age 28, she was 24. There were no children in the household. Boyd and Eulita were enumerated in the 1920 Justice Precinct 8, Limestone Co., TX, federal census. He was a farmer age 38, she was 34. Children in the household were Morese 8, Maurine 8, Callie 5, and Minnie M. 2 years 1 month. Boyd and Eulita were enumerated in the 1930 Dallas, Dallas Co., TX, federal census. He was a filling station owner, age 47, she was 42. Children in the household were Maurice 18, Maurine 18, Evelyn 15, and Minnie M. 12. Also in the household was mother-in-law Alice Moffett, 80, and sisters-in-law Minnie L. 48, and Callie 38. Euleta Maffett was born in January 1886 at TX.1,2 She married Boyd Roberts Garrett. Jonathan Haines was born circa 1819 at OH. He was the son of Allen Haines and Sarah Ballinger. Jonathan Haines married Mary Jane Sprague on 15 March 1840 at Champaign Co., OH. Mary Jane Sprague was born circa 1823 at OH. She married Jonathan Haines, son of Allen Haines and Sarah Ballinger, on 15 March 1840 at Champaign Co., OH. Mary Jane Sprague died between 1852 and 1857 at Byhalia, OH. Allen Haines was born on 29 September 1794 at Burlington Co., NJ. He married Sarah Ballinger, daughter of Joshua F. Ballinger and Sarah Jones, on 2 January 1817 at Champaign Co., OH. Allen Haines died on 5 May 1861 at Rush Twp., Champaign Co., OH, at age 66. Sarah Ballinger was born on 3 June 1800 at Evesham Twp., Burlington Co., NJ. She was the daughter of Joshua F. Ballinger and Sarah Jones. Sarah Ballinger married Allen Haines on 2 January 1817 at Champaign Co., OH. Sarah Ballinger died on 11 November 1866 at Rush Twp., Champaign Co., OH, at age 66. Joshua F. Ballinger was born on 20 October 1762 at Evesham, Burlington Co., NJ. He married Sarah Jones, daughter of Henry Jones and Hope Wallace Lippincott. Joshua F. Ballinger died circa 1814 at Middleburgh, Logan Co., OH. Sarah Jones was born on 10 March 1762 at Trenton, Burlington Co., NJ. She was the daughter of Henry Jones and Hope Wallace Lippincott. Sarah Jones married Joshua F. Ballinger. Sarah Jones died circa 1817 at Middleburgh, Logan Co., OH. Henry Jones was born circa 1734. He married Hope Wallace Lippincott, daughter of Freedom Lippincott Jr. and Elizabeth Wills, on 23 August 1760 at NJ. Henry Jones died in 1804 at OH. Hope Wallace Lippincott was born on 18 January 1725/26 at Evsham Twp., Burlington Co., NJ. She was the daughter of Freedom Lippincott Jr. and Elizabeth Wills. Hope Wallace Lippincott married Henry Jones on 23 August 1760 at NJ. Hope Wallace Lippincott died before 1801 at NJ. Freedom Lippincott Jr. was born on 6 February 1693/94 at Evesham, Burlington Co., NJ. He was the son of Freedom Lippincott and Mary Austin Custance. Freedom Lippincott Jr. married Elizabeth Wills on 17 November 1715 at Northampton, Burlington Co., NJ. Freedom Lippincott Jr. died in August 1768 at Evesham, Burlington Co., NJ, at age 74. Elizabeth Wills was born on 14 September 1697 at NJ. She married Freedom Lippincott Jr., son of Freedom Lippincott and Mary Austin Custance, on 17 November 1715 at Northampton, Burlington Co., NJ. Elizabeth Wills died on 2 April 1740 at age 42. Child of Elizabeth Wills and Freedom Lippincott Jr.